Some people collect spoons, mugs or thimbles to keep track of their travels. I collect embroidered patches. It started on my honeymoon when I bought my first patch at Luray Caverns in Virginia. 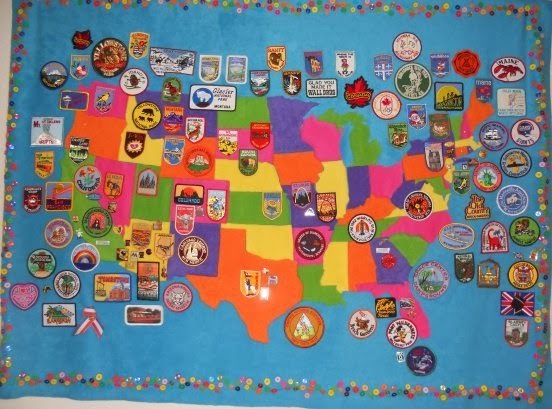 When I moved four years ago to a retirement village in Glendale, Arizona, I had a plastic bag filled with over 100 patches. I decided to do something with them – creating a map to display all the places I had visited. I bought a large inexpensive map of the United States and cut out the individual states. I placed them in five different piles, each one representing a color, based on a placemat I had that depicted the states with no two states touching in the same color. I used a felt like fabric that didn’t fray so no hemming was required and cut out a rectangle of 43 X 57 inches of turquoise. I bought pink, yellow, orange, green and purple in the same fabric for the states. 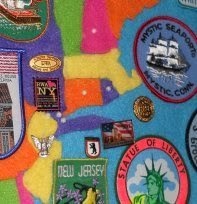 Once I had all the states, I placed the turquoise fabric on my living room rug and created the map. My ambitious plan required sewing all the states together on the background cloth, but that became too awkward so I settled on a fabric glue. This proved to be simpler and less time consuming. Even so, working on it steadily, the project took over two weeks of not being able to use my living room. Over the years I also collected pins from RWA conferences, honors, awards and other celebrations that sat in my jewelry box. They went on the map, as well. Each place I lived in received a tiny pearl bead. Once completed, I added four tabs at the top for hanging. It needed something more, a border, so I found bags of colorful buttons at Wal-Mart and sewed them around the edge. That last part probably took the longest time. I call this “My Memory Wall Hanging.” I enjoy it everyday and add to it whenever I travel. All those blank areas across the country have been added to my bucket list, and I hope to fill all those states with memories. Have you created anything similar to record your memories? I just love this. What a great idea! It took years of thought but I finally made it. Marion, you are so clever. And what a great way to keep all of the mementos. 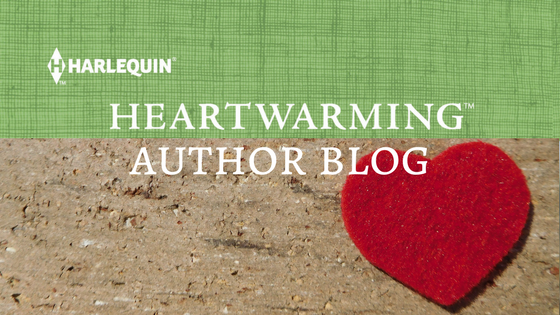 I have so many RWA pins that they won't all go on one badge any more. And I'm beginning to lose the backs on some. I think you can buy backs at the craft stores. I have all of my book covers framed and on the wall in my office. Denny started it and the kids badger me to keep it up. I collect baskets and should have a sign that says crazy basket lady. None of my collections are as put-together as yours. I used to take all my RWA pins to conferences but I like having them all in one safe place so much better. And I get to see them and appreciate them more often. Marion, I have all my book covers, but am about three years behind on framing them. I blame the nine year old for that LOL I love your map. What a cool idea, especially adding RWA pins and such. One nice thing about having children, you can always use them as an excuse for any kind of procrastination. I love it, Marion! And I especially love the border of buttons, so I'm happy you took all that time to do that. When I was little, my mom was a seamstress and had a huge button tin (like those Danish butter cookies come in) and I could rummage through it to decorate a doll dress. My office is tiny, but I have a painting of roses that Ron gave me as an engagement gift, my covers, little things the kids have given me, and a cat collection. Right now, a real one is grooming himself on a book shelf. I LOVE your map. Thank you for sharing that. My mother's mother had a large jar of buttons and my father's mother had a jar of change. I liked the latter better, especially when she let me put my hand in and take out some money. I took so much I couldn't get my hand out. Ended up with only a few coins. Very cool. My step-mother once did a collage where she glued all her mismatched earrings to glittery foam board. Then she framed it. Wonderful idea. So often I'd end up with only one earring, always something I liked, and had no way of using it again. I love your "map!" I have a bulletin board with pictures, inspiration sayings, and anything that touches the sentimental bone in me! Thanks for the post!! That is so cool, Marion! I used to be a scrapbooker. I documented everything the kids did when they were babies. I also journal to document the good and bad that's happened in my life. It's interesting to go back and read it now and again. That's incredibly cool, Marion! I used to collect mugs, but then I started running out of cabinet space lol. Now I collect card decks and some other small items.